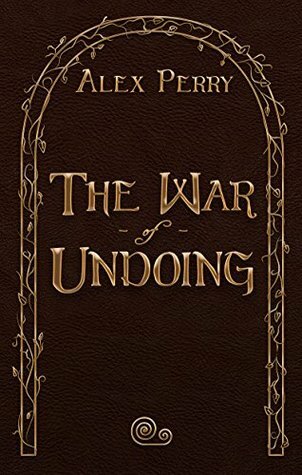 The War of Undoing takes readers on an exciting journey into a world on the brink of tearing itself apart. It is the first book in the Kyland Falls fantasy series, and is Alex Perry’s debut novel. This book is a finalist in the SPFBO 2017. The War of Undoing is one of those books that left me kind of divided. This is an epic fantasy saga that tells the story of three impoverished, unchaperoned kids in a world that’s pretty divided between humans and vuma, magic and science, and culture clashes that come along with all of that. It’s pretty thought provoking, and the setup was well done. The War of Undoing is told from four perspectives. That’s fine, but where this might lose some readers is that each of the perspectives is doing in first-person. On the one hand, this really allows readers to get into the heads of the characters, to really understand who they are, as well as their thoughts and motivations. On the other hand, first person POVs can turn off some readers, so be aware of that before you dive on in. This book is highly character driven, which you probably expect from the first-person perspectives. This was another positive/negative aspect for me. The characters themselves, and feeling particularly attached to them is what really made me care about the world that was being built, and the various conflicts that were coming at me as the story progressed. On the flip side, I felt less invested in the world than I probably should have, and some characters enchanted me less than others, which made me sort of gloss over some parts of the book. That’s a gamble that authors take when writing a character-driven book. If the characters don’t compel the reader, then parts of the book will drag. The pacing was kind of wonky. The War of Undoing is a slow burn book. It starts slow, and takes its time developing into something else entirely. This is absolutely epic fantasy, but it takes a little while to understand where the epic part of the equation fits. If you aren’t willing to invest in a slow start, this book might turn you off before you get to the good stuff. And there is good stuff, it just takes time to get there. I loved the writing. I worry with multiple first person POVs that the different voices will sort of blend together to the point where it’s hard to tell the characters apart. At the start of the book, I felt a little bit of this problem, but as the book progressed and the author really got comfortable with the story they were telling, each voice became distinct and each character became their own creation. Aside from that, the writing itself really helped with the world development and the overall feel of the book as a whole. I really loved the atmosphere that the authors prose developed, and layered throughout the text. One thing I absolutely loved about this book was the secondary world created. It’s not really the sort of epic fantasy that I typically read about. There’s talk about trains, and banks, and wars, and social systems in place for people who fall in the cracks, like the three siblings we’re introduced to from the start. It’s a world that feels on the cusp of change, whether industrially, or governmentally or in other ways, and that teetering aspect of the world building is probably what captivated me more than any other part of the book. The interesting time/place feel, and the subtle development of complex conflicts woven throughout the book that served to build up the plot and characters was nothing short of fantastic. So, was this a good book? Absolutely. I enjoyed it. While some of the characters worked for me more than others, I enjoyed their perspectives. I think this is a story that was told the right way to make it more powerful for readers. Yes, it takes some work to get to the good parts, the start is slow, and some of the pacing at various points noticeably lagged, but the heart of the book is very good. I will caution readers, because I don’t think this is a book everyone will like. I mean, what book is? However, if first person POVs turn you off, or if you aren’t in the mood to invest some effort in a slow start, then you might want to pass over this one. If those things don’t turn you off, then give this book a try. It is well worth your time.